Things I liked: i bought these merely as a curiosity, because when it comes to accuracy, most of my air rifles tend to prefer the traditional, domed shape pellet styles. Although i mostly target shoot and plink, i occasionally go pesting with my rifles so i'm always on the lookout for hunting pellets with good expansion to empty the most energy into the target instead of it just passing through. to my great surprise, these pellets shot out of my Benjamin Marauder like a LASER BEAM. i haven't fired any into ballistic gel or pests yet to check expansion, but i've been shocked at the accuracy these pellets have delivered. by far the most accurate hunting pellets i've used, (at least in my rifle, your mileage may vary) and they even surpassed most of the traditional domed pellet shapes i've been using. i'm eager to try these out on pests, and am confident that they can deliver the accuracy required to put the animal down as humanely as possible. What others should know: only that air rifles are quite finicky about what they tend to shoot well. experiment. A LOT. using different brands, weights and shapes of pellets. also, if your air rifle has multiple power settings, experiment with it as well. you may find that some pellets you thought were awful and unusable in your rifle perform exceedingly well at different power settings than when you tried them initially. (and at different ranges) i know this from first hand experience, and the discovery of this kind of knowledge is one of the fun things about being an air gunner. Things I would have changed: Quantities. I would do a 200 count. Things I liked: Quality and consistent accuracy. Shooting these at low speed and they are doing nicely. Things I liked: Testing different pellets in my hatsan flash 22, I found the jsb monsters and ultrashocks had groups the size of a quarter at 60 yds. There was little to no drop so no holdover was necessary. I did crank the power up a little bit on the hatsan hammer spring. I was surprised that the ultrashock was so accurate when such a blunt looking front end and the deep hollow made me think that they wouldn't be any good but I am totally impressed. What others should know: If you have too little power these will not fly very far so you need to get them up over 700 feet per second. At just 15 feet I shot them into a jug of water and they expanded more than anything else I've ever tried. Things I liked: Accurate and very hard hitting with powerful airguns. My MaximaThor loves these. 944 FPS, 50.25 FPE. I use them between 15 and 40yards and they totally vaporize rat and squirrel heads. Things I would have changed: Make these in .25 caliber, please. Screw on lid, more for a lower price? These are a great at any price actually. Buy three, the fourth is free at Pyramyd. What others should know: These really hit like a ton of bricks, and are very accurate through Lothar Walther Barrels. You need a powerful airgun to mushroom these properly. My MaximaThor exceeds the 44 FPE advertised by Walther. Used two chronos, and they are both the same reading. Things I liked: These pellets are best suited for high powered PCP rifles.I used these pellets in my AT 44 10 to shoot a Crow @ 55yards and aimed at the bottom of its neck.All I heard was a wwwhack and the Crow folded and fell to the ground dead ! Things I would have changed: Maybe a more slug or bullet shape. What others should know: Like I said you need a high powered rifle so that they are moving fast enough to be accurate ,and to mushroom on contact.Also these pellets mushroom more than any other pellets I've tried !!! Things I liked: The skirts looked good on most of pellets. Things I would have changed: Their was alot of variances in weight and my gun did not like them. I would do a better job on the weight distribution. Even if my gun did like them i cant see anyone shooting good with them. What others should know: Weigh them alot of variances. Things I liked: same good quality as always from jsb. Things I would have changed: 100 ct can with twist off would be nice. What others should know: used these to try my new gamo magnun for the first time. using just the sights (no scope) i put 3 shots in the bull at 75'. have not adjusted the trigger yet. i can tell this is a hard hitting combo. Too heavy for that marauder pistol. Things I liked: Accurate and packs a PUNCH!! Great expansion. Things I would have changed: Lower price. More per tin. What others should know: You'll love the knockdown power this pellet has. Things I liked: Used in: Benjamin P-ROD w/ high flow Marmot Militia transfer port and 6 chamber carbon fiber silencer. These pellets are accurate and hit hard, real hard. I use them for close to mid range pest control and am amazed with the results. Even though they are some of the more expensive pellets I have (about 15 varieties), I still have a hard time loading my clip with anything but these. 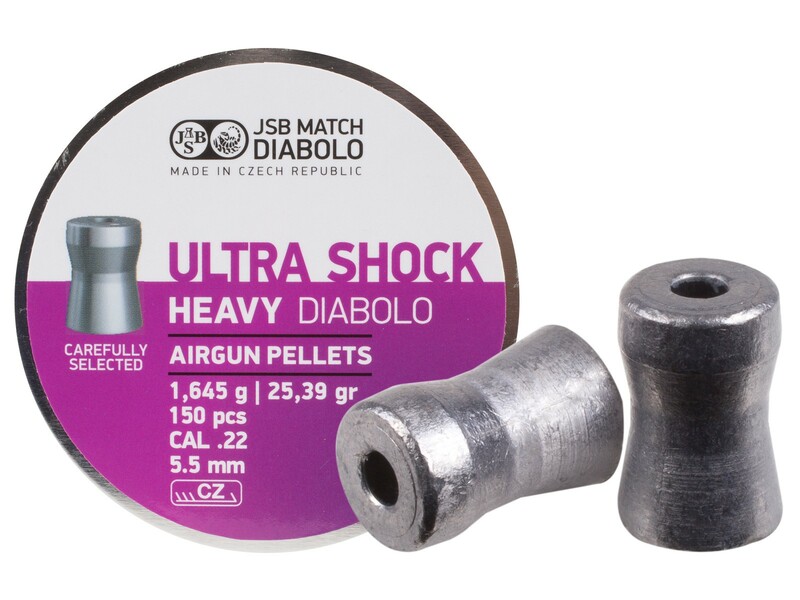 I thought the JSB heavy domed pellets were there best you could get, but these are better. They create an extremely satisfying "THWACK!" when they strike the target, especially when it's a squirrels head. Hands down my favorite pellet for the P-ROD. Things I would have changed: I wish they were a little cheaper, but with the buy 3 get one free, they aren't too bad. They are definitely worth the price. Things I liked: i use these in my Benjamin armada very good knock down power. i took a woodchuck at 35 yards. Things I would have changed: come on JSB get with the program screw on LIDS!!!!!!! i don't like using my crosman TINS. more per tin. What others should know: shot these 11 times 10 just to see how they would do once for the pest.not cheap to be using for target practice. Things I would have changed: Make it 200 or 250 count in tins! What others should know: This is a great hunting pellet! These work very well with my .22 MaximaThor. Very accurate, 1/2" groups at 30 yards. Very hard hitting, Average 856 FPS from a full charge, eight shots. Stdev. 7.9, 41 FPE average. Very humane for the control of squirrels and rats. Things I liked: Heavy, consistent, accurate, well made, excellent BC & great expansion. Things I would have changed: Screw top tins & larger quantity. What others should know: Best expansion from a mass produced pellet I've ever used. Things I liked: Heavy, well made, uniform & lethal hollowpoint. Things I would have changed: SCREW TOP LIDS! What others should know: I you have a rifle that can push these 25g pellets fast enough, then give them a try. They expanded better than any other mass produced HP I've used before. These are very accurate with my .22 MaximaThor. 3/8" groups at 66 feet. 42.4FPE. 867 FPS. Things I liked: Consistency and quality. The sound these things make smacking into my dirt bank is like no other. Only can imagine what thump it'd make on small game. Accurate at 20 yards in my benjamin maximus and marauder both. At 40 yards in the marauder you can clearly hear them whistle! Accuracy suffers some but still holding just over an inch group with a full magazine, pretty wicked sound, definitely a hard hitting pellet. Things I would have changed: Bigger tins? Though not the most accurate they definitely are hunting worthy, I'd happily pay extra for a 350 count tin. What others should know: Anyone out there capable to make spec ballistic gelatin should try these on it. I'm curious to see what kind of expansion and wound channels these bad boys make on. 20fpe+ rifles. These pellets hit like a ton of bricks with my .22 maximathor. I hit three rats at 65 feet, one at 46 feet. Extremely humane. They totally vaporize an over-ripe avocado, and a full soda can explodes. These are very accurate and consistent . I wobble a bit, but still keep most inside a 5/8" target at these ranges. On a full charge, a string of eight shots were all over 40 FPE , measured at six feet. This group was 5/8" at 65 feet. I'll get some ballistic jell when I remember. Things I liked: Excellent expansion, well formed, consistent with decent weight. These are definitely hunting pellets! Things I would have changed: Screw top lids & larger quantity. What others should know: These have the best expansion of any hollowpoint I've ever used. Their expansion was twice that of the H&N Hunter Extremes. Obviously, you have to have the velocity to make them expand, so a lower powered PCP or springer might not have enough uumph to fully utilize their potential. At 25yds, they were a single hole for 10 shot out of my Rainstorm-I shooting at 930fps.